Powder coating is the answer for those searching for a way to create a tougher hard finish than conventional paint without compromising the quality of the finished product. Typically used for coating of industrial hardware, powder coating is a versatile procedure that Decora Powder Coatings Ltd. Is able to use to fit your needs. Whether it’s for home or business, powder coating offers finished products that are superior in terms of quality, durability, and cost-effectiveness. The development of newer, longer-lasting materials used in construction has driven the development of the powder coating process which Decora Powder Coatings Ltd. offers. Currently, the automotive industry has been the biggest driver of growth, but another wave of strong growth in popularity is seen by the furniture, appliance, and architectural markets. Investing in long-lasting painting solutions like powder coating has proven to be profitable and cost-effective by the many companies that have currently engaged with the painting process. Finished products maintain that initial fresh look far longer and can go far longer without needing a replacement coat, which is why it has become a clear-cut solution for businesses looking to invest in materials that will stand the test of time. The fact that powder coating lacks a liquid carrier makes all procedures fundamentally different from conventional painting in how they impact the environment. Since there is no carrier fluid to evaporate away, the process emits very few volatile organic compounds (which have been shown to be damaging to both human and environmental health). This means that in a contained environment, which Decora Powder Coatings Ltd. offers, powder coating is a huge step forward in how our painting processes affect environmental and human health. 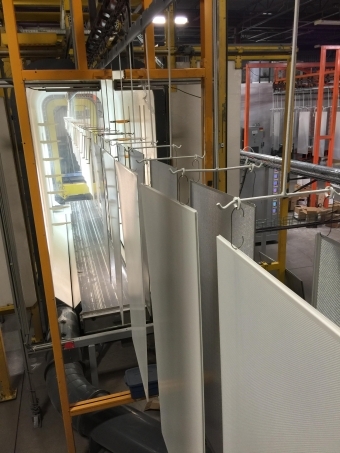 Another major advantage in terms of environmental sustainability comes from the fact that the over-spray collected from powder coatings can be recycled in certain circumstances. If you're looking for a long lasting and beautiful coating that will withstand the test of time, look no further.